My tiny windowless hall looked quite dark and dreary when I moved in, so I decided to funk it up with a little color. I also needed a coat hanger so... two birds, one stone. To create your own, you need about 50 wooden ball knobs with a 3,5 cm (1,5 inch) diameter, 6 wooden cloth hangers, twine, nails and acrylic paint. The material cost me about 25 € (30 $). 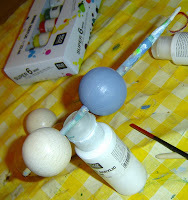 Start with painting the balls. You can go as crazy or subtle as you want. 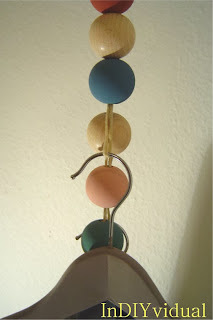 I think this would look awesome with neon colors or using only white and natural balls. I wanted a colorful but matte finish. The trick to that is mixing the main color not only with white but also a drop of black. I discovered that putting the balls on an unused brush worked really well to hold them still without messing up the paint. Once the balls dried, I threaded them onto twine. The twine should be twice the height of your room, to be on the safe side (though you can easily knot on more if needed). 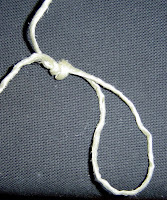 After a couple of balls, form a loop, secure it with a knot and thread it through the next ball, but not the one after. Repeat as often as you want. I wanted most of my hangers to end up about waist high, so I put most of my loops there. You can leave some stretches of twine free, as I did, just secure the ball above with a couple of knots. So now I have a coat hanger and some color in my hall! And I will soon show you my matching coat rack!